"Design" : bass-reflex, built-in amplifier, dual high-velocity low-turbulence resistive ports, single driver. "Amplifier" : High-Current, Discrete Output - 900 watts Dynamic Peak / 300 watts RMS Sustained. "Amplifier Design Features" : Auto-On/Off, soft clipping. "Bass Driver(s)" : 305-mm (12 in) CAPâ„¢ Carbon / Aramid-Fiber Polypropylene Cone, ceramic / ferrite magnet, 50-mm (2 in) 4-layer voice-coil, AVSâ„¢ die-cast heatsink chassis. "Speaker-Level Input" : From Left / Right speaker terminals of receiver, amplifier or main / satellite speakers. Running this sub with a Denon 3311, Q Acoustics 2050 floorstanders for the fronts and two pairs of Q Acoustics 2020s for the rears and surrounds with a 2000Ci for the centre. Connected with an Audioquest Sub-X cable. In a large room about 25m x 15m. Used primarily for home theatre and some music. Straight out of the box this sub had the ground shaking and chest thumping bass I was looking for, that was apparent when I auditioned it at my local hi-fi store. Even at low listening volumes the DSP-3200 brings real power and bass when required, but isn't growling through movies and spoiling subtler scenes. The finish is nice in black ash and has a removable grille which reveals an impressive forward facing woofer and two bass ports. It is large, so don't expect to hide it, but it is probably a sub you'll want on display anyway. I can easily recommend this sub for those people working on a $1000 budget, and would even go so far as to say it is a must audition. When it is ran in with a few hours under its belt it continues to impress and delight and provide fist clenching moments of room filling bass during movies. I've had this sub (DSP 3100) in my 2-chanel system for about 2 months so it may still have some break-in time left. Even so, I am very pleased with the way it's fit in with my main speakers (vandersteen 2CEsig). Anyone who buys this sub, which I recommend, must, I repeat MUST have the dealer come to your home and use the Paradigm miking sustem and software to optimixe this sub to your room. This is an additional cost, but well worth it; you're only getting a fraction of the performance this sub is capable of without the proper set-up. I would not have believed the difference it makes! We aren't talking subtelties here, but significant and obvious differences. We used Joan of Arc from Jennifer Wanes Famous Blue Raincoat for a reference and the change in bass response in the deep synth bass as well as the improvement in Leonard Cohen's chesty voice was remarkable. And that's right out of the box! After a couple of months, it continues to improve. Listened yesterday to Joe Walsh's Life's Been Good and the kick drum was fantastic and the bass guitar in Yes' Long Distance Runaround had great crunch and oomph. My listening room is 12X16 and has a cement floor so getting good, deep bass is no easy task, but this sub delivers! Highly recommended at this price ($670 Can. all-in). 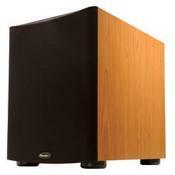 This review is for the 10 inch DSP-3100. Primarily used in a home theater setup with some critical music listening at times. Modest room size of 15 feet by 13 feet. Equipment: PS3 to a Pioneer receiver (VSX-919AH) in 6.1 mode driving older but excellent Camber speakers (3.5ti for mains). Even though the room is small I tend to listen to my movies loud. In fact I find the local theater often plays way too low. I was happy with my system's sound before adding a subwoofer however on rare occassion very loud explosions would cause the 8 inch drivers on my main speakers to bottom out, resulting in a God aweful mechanical clacking sound. I had opportunity to borrow an older Paradigm PDR-10 for several months and was impressed with how the sub filled in the bottom end on movies without adding boom. I was suprised to find little difference with music but suppose the 3.5ti's play quite deeply on their own. When the PDR's owner came knocking I went shopping. Unfortunately local choices are some what limited. Several stores carry mid-range Polk and entry level Velodyne which tend be poorly rated. Thankfully we do have a local Paradigm dealer. I initially was interested in a PDR-12 but found the new DSP line had replaced it. I was thinking DSP-3200 but the store was out so they offered a very reasonably priced DSP-3100 with the option to upgrade. The store owner said that if I was basically happy with the old PDR-10 then the improvements of the DSP-3100 would be more than enough for my system. I took the smaller sub home, fully intending to upgrade to the 12 inch DSP-3200 as soon as one came in. Well, that was 4 months ago. I have been using the DSP-3100 extensively, mainly for Blu-ray movies, but also for music. I continue to find the addition of a sub (likely any sub) gives mimimal improvement for music in my system. The sense of power it has added to movies however is simply amazing. I first set it up in a front corner of the room, next to the right main. The volume of bass, even at low level, was crazy but I had a sense that it was a bit "fat" or "bloated" sounding. Nothing outrageous, just not as controlled as I like. I moved the sub into my equipment shelving unit in the middle of the front wall and all concerns about sound quality disappeared. I had read over and over again that sub placement and room effects are almost as important as the sub itself. I am now a believer. Initially I played around with cross-over settings on my receiver but in the end left it at the factory preset of 80hz. I have tweaked the level up a couple db's from where the Pioneer's auto-calibration mode left it, but otherwise I never find the need to twiddle. The Paradigm sub blends in and extends the bottom end of my system perfectly. It adds a deep controlled foundation and provides aural and visceral impact when needed. It does not produce the annoying drone that some subs do and even at rediculously loud volumes I never notice any mechanical noise. For a couple hundred dollars I could upgrade to the DSP-3200. If I had a very large room I might but for my current set up the extra bottom end simply is not needed. I would like to rate the Paradigm at 4.5 stars rather than 5 simply because I have never had a high end reference in my home to compare it to. Given the incomprehensible 1 star rating of a previous reviewer I will let my 5 stand. This review is on dsp 3100. I have all paradigm setup except the subwoofer. So when it came time to pick a subwoofer, the thought of buying anything other than paradigm didn't even surface on my mind. Didn't even bother to audition. When I brought dsp3100 from the store. It was boomy, muddy, sloppy and just over all mud. No amount of fiddling with position, xover and cutoff would work. Went back to the dealer and they said the sub was fine so i'm stuck with it. Ebay it shall go. I paid 549$ for this amazing sub! This thing just rocks. Plenty of bass for even the biggest rooms. I used to have a Paradigm PS 1000 and was little boomy at times, so I decided to upgrade to better technology regarding amplifier and speaker itself. You could a notice a difference as it is not boomy at all even at high level's. The grill does come off which is a nice feature for certain rooms. I paired this up with a 4 Paradigm Micro's and one Cinema 110C center and it blends it well with these. Like said, this thing pounds! It sounds great with hip hop, rap and techno but I put on some faster techno and it kept up pretty good for a 12 inch. It also goes deep at high level's without distortion whatsoever. Overall it is worth every penny.